Tiamulin is a diterpenic veterinary drug widely used in swine for the control of infectious diseases, including swine dysentery and enzootic pneumonia. 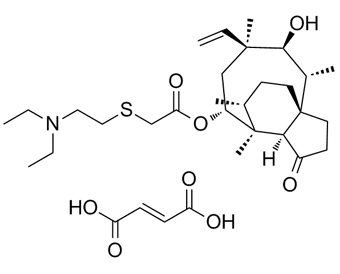 Tiamulin fumarate is a semisynthetic pleuromutilin antibiotic that binds to the ribosomal peptidyl transferase centre and inhibits protein synthesis.
. Noa M, et al. Tiamulin-nitrovin interaction in pigs: a case report and experimental reproduction. Vet Hum Toxicol. 2000 Oct;42(5):286-8.
. Dreyfuss J, et al. Metabolism of tritium- and carbon-14-labeled tiamulin in dogs, rats, and pigs. J Antibiot (Tokyo). 1979 May;32(5):496-503.
. Islam KM, et al. The activity and compatibility of the antibiotic tiamulin with other drugs in poultry medicine--A review. Poult Sci. 2009 Nov;88(11):2353-9.